Annoying, unpleasant and unhealthy – every home has a problem with house dust. What many people don’t realize is that dust particles are made up of billions of parts, the greatest share of which is fine dust. 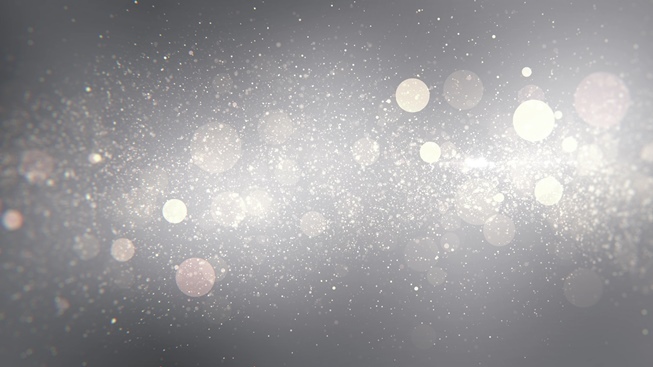 These tiny grains of dust are anything but harmless to your health. They include pollen, house mite faeces, bacteria and mould spores. The fine dust particles can get deep into your lungs and irritate the respiratory system. This is not just a problem for those with allergies but also for healthy people. Find out here how to protect yourself from house dust or take a look at our video now. Why can fine dust be hazardous to your health? 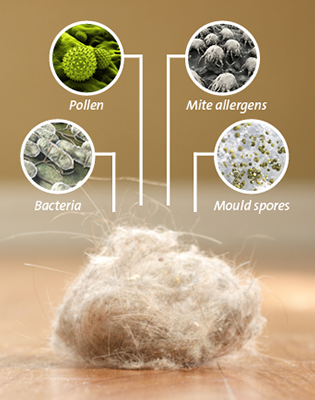 Among other things fine dust consists of pollen, mite faeces, bacteria and mould spores. The smaller the dust is, the more hazardous it is to health. If you vacuum at home then you assume your home is clean. But what few people know is that fine dust is also vacuumed up and then released again when the dust is disposed of. Which vacuum cleaning system can best protect you from this? Bagless vacuum cleaners emit more mini particles when emptying and cleaning than models with bags. Experts measured up to ten times higher fine dust concentration in the air than when using appliances with a vacuum cleaner bag. Three times as many unhealthy bacteria, mould and mite allergens were measured in the air while the disposal of dust from bagless vacuum cleaners. 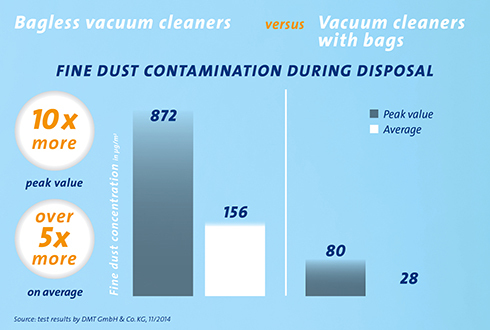 When disposing of dust from a Swirl® vacuum cleaner bag you have less contact with fine dust, bacteria, allergens and mould. You also have less work, as due to the lower capacity of the dust collector in bagless vacuum cleaners you need to empty and clean them at least eight times as often. Reduce your contact with dust to a minimum and keep your home clean. If you regularly vacuum your home then you can keep fine dust levels at a minimum. A vacuum cleaner with bag has the advantage that it keeps allergenic fine dust safely in the bag – so even when you dispose of the bag it cannot cause any more harm. The fine filtration layer keeps not only normal house dust but also allergenic fine dust such as pollen, mould spores, mite faeces and bacteria safely in the bag. The vacuum cleaner bags have a Dirtlock® closure. 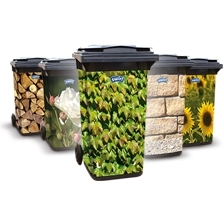 This allows you to dispose of the bag without much dust or dirt escaping. The dust stays where it belongs: in the bag. 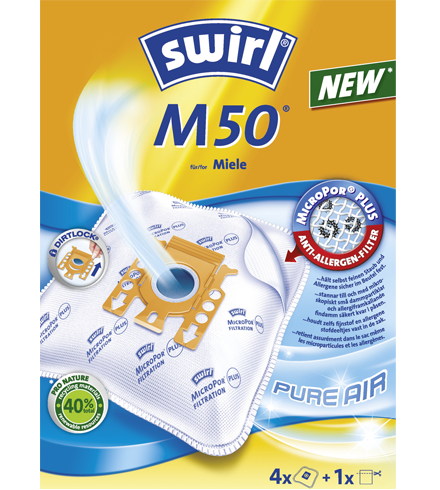 During the disposal of a Swirl® vacuum cleaner bag you have less contact with fine dust, bacteria, allergens and mould. You also have less work, as due to the lower capacity of the dust collector in bagless vacuum cleaners you need to empty and clean them at least eight times as often. During cooking, your cooker hood extracts most of the fine dust particles. Pollen screens on your windows prevent dust from entering your home. Ventilating by leaving your windows wide open for ten minutes allows less dust, exhaust fumes and dust into your home than leaving your windows tilted open for longer periods. Decoration, heavy carpets and curtains magically attract dust. If you don’t want to do without them completely then you should regularly dust and clean textiles. Clean in the right order. 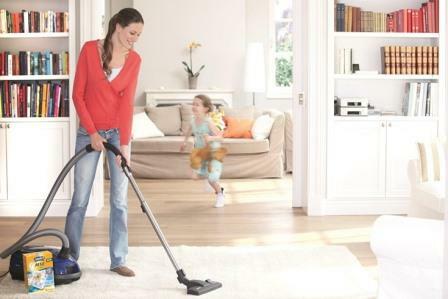 Vacuum cleaners with particle filters and Swirl® vacuum cleaner bags make vacuuming more effective and more healthy. It is also good to vacuum first then dust. Otherwise dust raised from the floor will settle on other surfaces again. How high is the level of fine dust contamination, which we are exposed to each time we dispose of vacuumed up dust or clean and maintain our vacuum cleaner? This was the question asked in two studies carried out by SGS Institut Fresenius and DMT GmbH & Co. KG for Swirl®. The experts tested dust and germ contamination with different types of vacuum cleaners – vacuums with and without bags. The DMT results show that dust contamination when emptying and cleaning bagless vacuum cleaners is over five times higher than for vacuum cleaners with a bag – even 20 minutes after disposing of the dust, the contamination was still three times higher. When emptying a bagless appliance the specialists from DMT measured a peak of ten times higher fine dust contamination. For a short period of time, DMT found that over 800 micrograms of fine dust per cubic meter were released into the air. This is equal to 16 times the European limits for fine dust per cubic metre of air (50 micrograms per day) and greatly exceeds the values at rush hour on Stuttgart’s busiest road: At the Neckartor junction around 146 micrograms per cubic metre were measured. 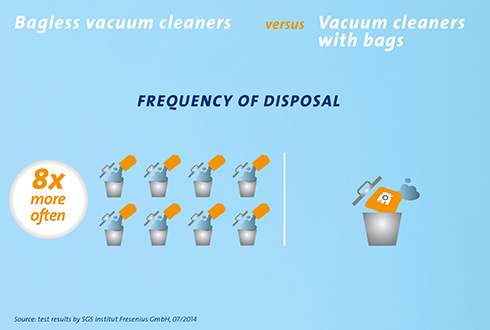 According to the SGS Institut Fresenius, bagless vacuum cleaners also have a lower capacity in the dust collector and so need to be emptied and cleaned at least eight times more often, whereby the user is also more frequently subject to fine dust contamination. 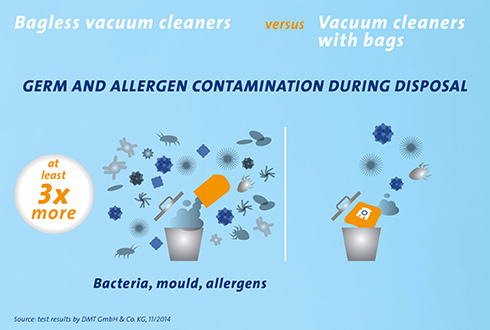 The SGS Institut Fresenius also measured the density of mould and bacteria in vacuum cleaners – and came to the following result: The microbial contamination of appliance and filter is clearly measurable in bagless vacuum cleaners. According to DMT, the concentration of bacteria and mould in the air when disposing of dust from a bagless appliance is also about three times higher than when using a vacuum cleaner bag. Mite allergens were found three and a half times more frequently.